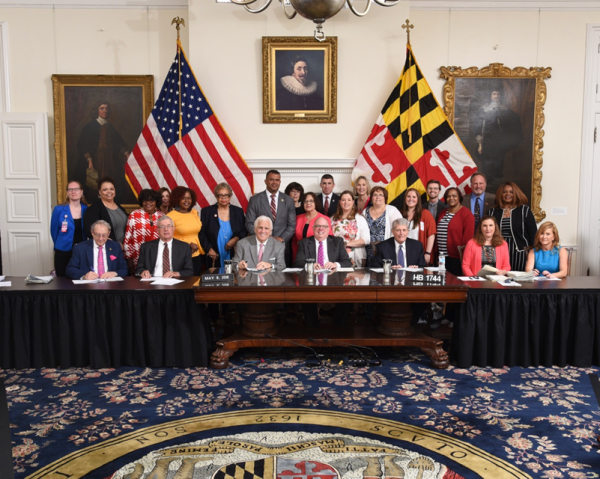 Baltimore—The Maryland Department of Human Services (DHS) and DHS Secretary Lourdes Padilla applaud Governor Larry Hogan for signing into law the Fostering Employment Act of 2018 yesterday. This legislation provides additional resources to help foster youth and homeless youth pursue career opportunities and achieve success. The law gives these young Marylanders greater access to trade schools and private internships, improving their opportunities to train for jobs in in-demand, skills-based industries such as construction, home repair, and mechanical services, among others. In addition, Governor Hogan signed the Tuition Waiver Eligibility Act of 2018, which expands eligibility for tuition waivers to additional youth in foster care, and gives them five additional years in which to obtain a tuition-free education. Brandi Stocksdale, LCSW-C, the recently named Director of Child Protective Services and Family Preservation at DHS, hailed the legislation as a “game-changer for Maryland youth in foster care” who are seeking enhanced access to educational opportunities. Foster care advocates say this expansion of benefits provides multiple paths to self-sufficiency and stability for youth aging out of the system. Furthermore, DHS applauds Governor Hogan’s support in changing the landscape for foster youth seeking more information about their civil rights. On Tuesday, the governor also signed into law the Children in Out-of-Home Placement Rights Act of 2018. It’s a “bill of rights” that will be issued annually to foster youth, ensuring that youth have the tools to voice their concerns and better understand what financial arrangements have been put in place to ease their transition to self-sufficiency. All three laws reinforce the Department’s Ready-By 21 Initiative, which enables and empowers Maryland foster youth to achieve self-sufficiency. DHS—the Maryland Department of Human Services—is the state’s primary social service provider, serving more than one million people annually. Through its 24 local departments of social services, DHS pursues opportunities to assist people in economic need, provide preventive services, and protect vulnerable children and adults in each of Maryland’s 23 counties and Baltimore City. Additional information can be found at dhs.maryland.gov, or on Facebook and Twitter.